Did you know that 20% of Canada’s homeless population are youth and that nearly 300,000 young people in Canada are forced to turn to food banks each month? And did you know that the poverty rate for young people in Canada is 17.3% and a startling 19.2% for aboriginal youth? 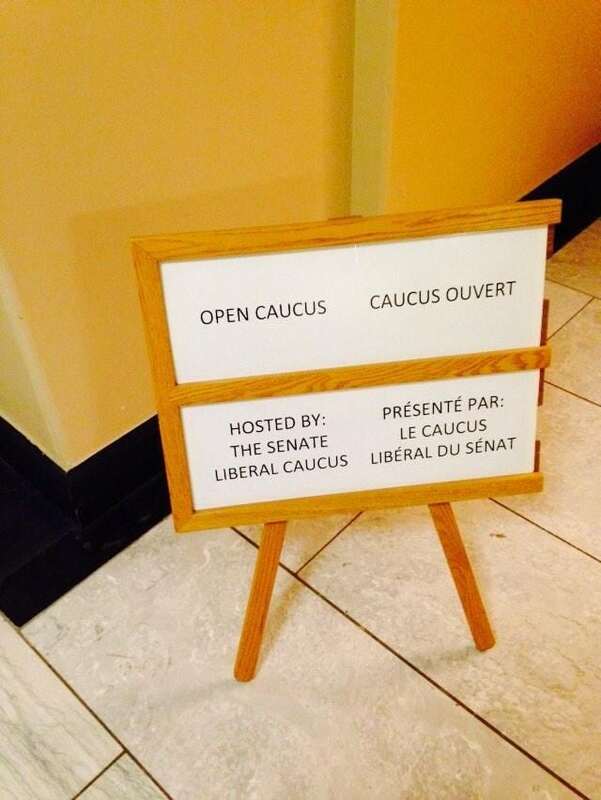 On October 22nd 2014, CWP was invited to address the Liberal Senate Caucus on youth, poverty and Canada’s human rights obligations. Due to the tragic events of that day, CWP spent the day in lockdown on Parliament Hill. The Caucus kindly invited CWP to present on the topic once more. This morning, along with colleagues from the Bank of Canada, Generation Squeeze and the Conference Board of Canada, CWP’s Legal Education and Outreach Coordinator, Michèle Biss, addressed the Caucus on youth poverty and the consequences for ‘generation squeeze’. Good morning honourable members. Thank you for this opportunity to present to you today on the important issue of the ‘generation squeeze’ and young people’s disproportionate experiences of poverty in Canada. I am Michèle Biss, the Legal Education and Outreach Coordinator for Canada Without Poverty. I am speaking to you today on behalf of Canada Without Poverty as well as a member of the ‘generation squeeze’. For those of you who are not familiar with our organization, Canada Without Poverty is a national charitable organization dedicated to the elimination of poverty in Canada through the enforcement of Canada’s international human rights obligations. Canada Without Poverty has a 40 year history – in fact, some of you may remember us by our former name – the National Anti-Poverty Organization. Our board of directors is made up entirely of individuals from across Canada who have experienced poverty first-hand. I would like to contribute to today’s dialogue by providing you with a sense of the dire conditions for many youth in this country. My comments will focus on the ways in which poverty interacts with age and what this means in terms of law and policy. I would like to situate my comments about youth poverty within the context of Canada’s international human rights commitments. As you are no doubt aware, Canada has committed itself to ensure that those who are marginalized or disadvantaged have the right to an adequate standard living, including adequate housing and food. Canada is obliged to use its maximum available resources to ensure these rights are respected and protected. We have signed numerous international human rights treaties to that effect – including the Covenant on Economic, Social and Cultural Rights and the Convention on the Rights of the Child. So, how do these commitments square with what’s happening on the ground? To be frank with you, the reality is that Canada’s track record in upholding these right for young people is weak, to say the least. By any standards, Canada is a rich nation, yet a disproportionate amount of young people in this country are living in poverty. Let’s take a look at the various manifestations of youth poverty in Canada. According to the 2011 National Household Survey – the most recent reliable data – the poverty rate for young people is 17.3% and the sense it that this is trending upward. This is several percentage points above the national average for non-youths. Aboriginal youth suffer even higher rates of poverty at 19.2% (according to the 2006 census, again the most recent reliable data) which is perhaps not surprising in light of the fact that an incredible 40% of indigenous children in Canada are living in poverty. I know we want to focus on youth today, but if you have 40% of Aboriginal children living in poverty, it’s unrealistic to believe that there is going to be some sudden drop in that statistic once they grow up to become youth. We know that education is key to lifting children out of poverty – but approximately 40% of Aboriginal youth and 60% of First Nations youth have not completed high school. Of course we have seen all too starkly how Aboriginal poverty can lead to grave consequences: over half of the missing and murdered Aboriginal women were under the age of 31 at the time of their disappearance and most had experienced poverty. Housing status and food insecurity are other indicators of poverty. The statistics on youth homelessness and hunger are alarming: 20% of Canada’s homeless population are youth and nearly 300,000 youth under 18 use a food bank each month. At post-secondary institutions across the country, there are now a proliferation of food banks to attempt to combat student hunger. The rise of food insecurity is quickly becoming a serious concern for youth in Canada. It affects everything from mental wellbeing to physical growth and nutritional intake. The correlation between a nutritional upbringing and school performance has been shown time and again, and yet we see this unsustainable reliance on food banks as the solution to hunger and not to take the time to examine what the root causes are. As you can see, these issues are complex, multifaceted and deeply interconnected. Canada’s recent track record in addressing social and economic issues facing young people in this country has been very weak, especially, in light of the resources available to governments to make a difference. As a ‘glass half full’ individual, I can tell you there is a lot of room for improvement. It’s well understood that addressing social issues like poverty, homelessness, and food insecurity requires a concerted effort – the adoption of laws, policies and programs, the aim and focus of which is to improve conditions for youth. Canada saw a rise in these social phenomena when governments started taking retrogressive measures, mining social programs or eliminating them all together and failing to adopt creative measures to address emerging social issues. For example, government spending on the Youth Employment Strategy was cut by $64 million between 2010 and 2013. It took a series of political, legislative and policy decisions to create these phenomena and it will take the same to reverse them. Over the past few years, the federal government has had a narrow focus on youth employment strategies as a solution to the many issues affecting youth. It is uncertain how effective these programs have been in addressing youth unemployment in light of the fact that most new jobs being created are part time, insecure and low-paying. Statistics Canada released a report on unemployment in June 2014 that declared the youth unemployment rate to be a concerning 13.4%. Equally concerning is the rate of employment for the same demographic dropped by 44,000. Clearly the government employment strategies are not sufficient to address the complex causes of youth poverty, homelessness and food insecurity. These Band Aid measures have not shown they definitively result in long-term, large-scale improvements in the living conditions for this country’s poor youth. I would also like to remind this Caucus that if laws or policies are adopted without consulting with or at least considering particularly vulnerable groups, such as youth, then those laws or policies may very well do more harm than good. Take for example, the Fair Elections Act where the government attempted to eliminate vouch voting, a move that would have disenfranchised thousands of young people. Many young people, particularly impoverished young people rely on alternative forms of identification, including vouching. Additionally, the Bill removed funding for Elections Canada to undertake programs to get out the youth vote. It is well known that if a young person votes when they are first eligible to do so, they are more likely to be a consistent voters throughout their lives. Like you, Canada Without Poverty was concerned about this bill and the way in which it completely ignored the effect of the Bill on the fundamental rights of vulnerable and disadvantaged groups. I wouldn’t want to end the presentation by focusing solely on what’s wrong for youth in Canada today. So, let’s try to imagine what we might do as a nation to take positive and progressive steps to improve the lives of youth living in poverty. 2. Young people must be included through meaningful participation in the development of law and policy. Addressing youth poverty is not as simple as solving a single problem, such as youth unemployment, or youth homelessness, but rather that we need a long term holistic plan to end poverty of adults, youth and children alike. There is no doubt that youth and children are a distinct group with particular needs, and those needs should be reflected in any solution. But of course youth poverty is undeniably tied to the poverty of parents as well as to the poverty they may have experienced as children. Furthermore, CWP believes that we need national level legislation that addresses all components of poverty. This legislation must go beyond the income side of the problem – legislation that understands the multi-dimensional nature of the experience of poverty. For these reasons we suggest that the most effective way to address youth poverty is by creating and implementing a comprehensive federal anti-poverty plan that considers all disadvantaged groups including young people. To create a poverty plan that is fully comprehensive may seem to be an unattainable goal due to the complexity of a document of this nature. However, I would like to point your attention to the Dignity for All campaign’s model National Anti-Poverty Plan for Canada. Many of you attended the release of this document earlier this month, a piece drafted over five years with recommendations developed from community input on six thematic areas relating to poverty. I encourage everyone in this room to take the issue of youth poverty seriously and consider the ways in which this plan can be used to take action in fulfilling our human rights obligations to address poverty. With respect to my second recommendation, our belief is that it is vital that young people be meaningfully engaged in the enterprise of law and policy-making. Young people must be expressly consulted and involved as key stakeholders in the development of law and policy. The phrase “nothing about us, without us” captures this concept. Young people need to be given a seat at the table in the development of law and policy so that they can effectively voice any concerns that will affect them. Merely paying lip service to young Canadians is not acceptable. I think Parliamentarians can take the lead in this regard by establishing a strong consultation system made up of young people to provide input in the development of law and policy that respects the reality that youth have distinct needs and perspectives. It is, of course, a cliché to say that youth are our future. But it’s true.